This page includes The WFSC First Day Cover Collecting: Spotlighted or in Passing columns from the 1995 issue of Across the Fence Post. If you collect first-day covers, you have chosen to preserve three significant bits of historical data. First is the stamp(s) used for franking the cover, second is the postmark on the cover, and third is the cachet or artwork. What I stated in my opening paragraph is certainly true, but the established cover collector, as well as the neophyte (a fancy word for "beginner" - I've had my dictionary open again), does not have to claim to be a preservationist in order to indulge in cover collecting. You just need to like this activity, and your liking can be without any conscious objective. My most loving wife has often said to me, "I would rather have you fooling around with your stamp collecting junk than to be sitting on a bar stool." You may have noticed that I have pulled a bit of a switch in terms. I started with "first-day cover" collecting and went to just "cover" collecting. This is because sometime in the future, I plan to discuss presidential inaugural covers, souvenir/event covers, and commemorative/fancy postmark collecting. There are numerous aspects to cover collecting, and it is to your advantage to choose one or several of them as your focus of interest. If you enter the field of cover collecting with the intent of being a generalist, you'll soon find that unless you're a billionaire, you will have to go on a diet of Corn Flakes. Or if you are a bit more disciplined, you will end up with a little of everything, and not much of anything. It is your task to decide which area or areas you wish to dedicate your efforts, and then precede. The alternative could be ending up at the local funny farm, where you might be able to collect flower pedals, not to mention the difficulty in obtaining albums for such a collection. In future columns, I will go more into depth about the various specialties and subspecialties related to cover collecting. And that's my comment for now. So what's your comment? Now that the preliminaries have been completed, the time has come to get down to the central theme of this column. So, let's talk first-day cover collecting and its various aspects. One subspecialty of FDC collecting that is little known by the outsider or the neophyte FDC collector is corner card collecting. This area of FDC collecting is more closely related to historical endeavors than most other aspects of cover collecting. For a cover to be considered as a corner card, a rule that is loosely followed is that it should bear the name and/or logo of a business and/or organization. A corner card FDC is an FDC that instead of displaying a cachet is actually a cover designed for business use. The subject of the stamp used for franking the cover should be related to the nature of the business/organization, and the stamp should have received a first-day cancellation. The top cover shown below bears the logo and return address of the former Wisconsin Telephone Co. It carries the Telephone Centennial 13¢ commemorative stamp of March 10, 1976 (Scott #1684). The overlapping cover illustrates not only a corner card, but also a very nicely done commercial cachet. This cover could be considered not only as a corner card FDC, but also as a cacheted FDC. One way of obtaining corner card covers for first-day cancels is to directly pay a visit to the business or organization of interest. Bring along a serviced comer card FDC so the person you are talking to can see what you intend to do. If possible, also bring a copy or illustration of the stamp that you intend to use. Then politely ex-plain your purpose in as few words as possible, avoiding philatelic jargon. Offer to return one serviced cover free of charge for every six or so covers that you obtain from that particular organization. I usually ask for 12 covers, but reduce it to six if the staff member that I'm seeing appears reluctant. I also leave my name and phone number in the event that they may wish to contact me. Then, true to my word, I always hand-deliver one or more serviced covers back to the organization, freely expressing my thanks. Be prepared to have your requests misunderstood, or perhaps flatly turned down. Again, courtesy should be your demeanor, and leave knowing full well that you gave it your best shot and did your best to protect the reputation of philately. I highly prize corner card covers from businesses or organizations that are currently defunct. They make it easy to blend the present with the past. Good sources for old corner card covers are flea markets, antique shows and shops, as well as rummage and garage sales. I pick up corner card covers that have not been used, even if I do not know of a related pending new stamp issue. For some time now I have had a small supply of brewery corner card covers. If the U.S. Postal Service ever decides to honor the brewing or an allied industry, I have a head start. Covers found at flea markets are sometimes slightly soiled, thus a good Art gum eraser is helpful for cleaning. Creases can be literally ironed out, though the flat iron you use should never be warmer than the amount of heat you can stand on your hand without discomfort. Use a protective piece of paper between the iron and your cover. Otherwise, your cover will be rapidly converted to an unusable bit of ash. Another source of comer card covers is through trading duplicates with other collectors. You can initiate contact with other corner card cover collectors through your stamp club or placing an inexpensive ad in Across the Fence Post or other such publications. And, that's my comment. So what's your comment/question? As I've mentioned before, choosing a method/topic for first-day cover collecting is not unlike choosing a method/topic for collecting other areas of philately. If a particular stamp catches your eye, has some special significance to you, or is related to some event in your life, then you may wish to start a collection of all of the distinct cacheted covers for that issue. If the stamp you choose was issued prior to 1940, the Planty Photo Encyclopedia of Cacheted FDC's will be most helpful. For stamps issued between 1940 and 1970, the Mellone specialized cachet catalogs of FDCs are suggested references. Both of these catalog options picture the cachets by issue. While they don't pretend to be complete listings of all cachets published during those intervals, they can take you a long way toward putting together a fine collection of cacheted FDCs for your favorite stamp. If your chosen stamp is a post-1969 issue, your collecting may be more difficult. Generalized photo catalogs for 1970 to present are unknown, though a few specialized catalogs for specific cachet makers do exist. One publication that might be of assistance is Mellone's First Cachets. This publication lists the names of most of the known cachet makers, the Scott number of the stamp used on their first cachet, and whether or not they are currently active. If a cachet maker has retired, the Scott number of the stamp shown on the last cachet is listed. At least you will have the opportunity to compile a list of cachet makers who might have published cachets for your chosen item. Another helpful reference is the list of known currently active cachet makers, which is updated and published annually by the American First Day Cover Society. Should you choose to collect by subject, you will find the procedures discussed above to be helpful. The only additional area of research is to discover what was issued for your selected subject. 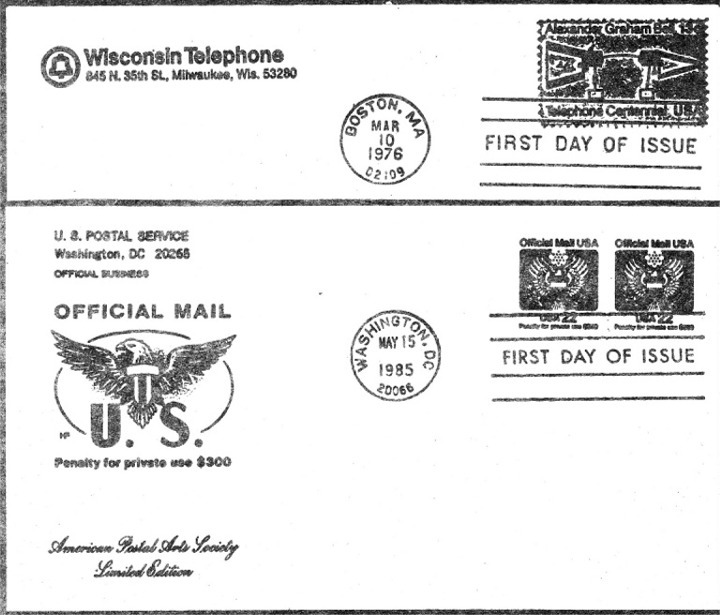 As an example, I collect FDCs that have some relation-ship to the Wisconsin territory and state of Wisconsin. Thus, I am greatly interested in FDCs for Scott Nos. 739, 957, and UX113. If you decide to collect all of the cachets for a specific cachet maker, I suggest that you learn if this person is still active, what was the first cachet produced by this individual, for what philatelic events does he/she publish, and does your selected cachet maker publish under more than one signature. This information can be obtained from Mellone's First Cachets or the AFDCS List of Current Cachet makers. If the cachet maker is still in business, you can contact the person directly and open a subscription account. You also can ask if the cachet maker has a stock of back-issued FDCs for sale. If your favored cachet maker is retired or deceased, you'll have to rely on the photo cachet catalogs previously mentioned for developing a want list. Perhaps the only source of items for your proposed collection are philatelic dealers, some of whom specialize in FDCs and others who are generalists but have a stock of FDCs. Most of these dealers will accept want lists and fill the lists as they acquire your wanted items. Unless an approval arrangement has been made, however, it is imperative that you specify how much you are willing to pay for your covers or you are at the mercy of the dealer with an obligation to pay what-ever she/he may ask for a given item. This may include collecting cachets that are done only in one color, hand-drawn/painted cachets, photo cachets, thermo graphed cachets, etc. I cannot offer much in the way of references other than to keep your eyes on the various articles that may appear in First Days, the official journal of the AFDCS, and the publications previously mentioned. You also can learn about the availability of such cachets by corresponding and trading with other FDC collectors. If you choose to collect hand-colored cachets, be prepared to spend approximately $20-$70 per item. A popular area of FDC collecting is first cachets of all known cachet-makers. Because of the huge number of new cachet makers constantly coming on board, it is almost impossible to remain current with all first cachets. A collector, however, can make an attempt at collecting first cachets of modern cachet makers by following the column "Cachet makers Update," which appears periodically in First Days. Other sources are the AFDCS List of Current Cachet makers, Mellone's First Cachets, and the photo FDC catalogs mentioned above. Space does not permit me to list greater detail on the items discussed in this article. Thus, for further information, write to me and include a No. 10 SASE. There's an area of first-day cover collecting that contains a great deal more controversy than most FDC collectors are willing to admit. I'm speaking of hand-painted and hand-colored cacheted first-day covers. Before I go any further, I should explain that a hand-painted cachet is one that is completely hand drawn and colored with some media such as colored pencils and/or watercolor-based pens, etc. The hand-colored cachet is usually a printed design or picture that is colored with colored pens or pencils. This area of FDC collecting offers some breathtaking art at heart-stopping prices, as well as some very nice items at moderate prices. A few years ago, I had the opportunity to view a collection of hand-painted FDCs that was truly extraordinary. I have no idea how much money had been invested in this collection, or what its current market value might be. All things considered, it was a pure pleasure to see this collection, one that I will remember for a long time. If this is something that is of intense interest to you, then it is a must for you to indulge your collecting passion. Your right to collect what interests you should never be criticized. I will try, however, to relate some precautions and make some recommendations in this collecting area. Along with the area of hand-painted/colored cachets, are overall cachets, in which the entire face of the cover is involved in the cachet. The franking may or may not be in its usual place in the upper right-hand corner of the cover. The cancel also may not be the usual first-day cancel, but may be the solitary bull's-eye from the first-day city or another city that may have a name that is significant to the subject matter of the stamp. All of these innovations do serve to increase the interest in this area of FDC collecting. The downside, however, is that covers executed in such a manner may not be considered to be pieces of mail and, therefore, may not be eligible for judging at some philatelic exhibitions. You may run into this problem if the exhibit is at a show that has only a few FDC exhibits. Often the judges at such shows have very little interest in first-day covers and may not consider them to be legitimate philatelic material. The artistic community has noticed the popularity of handcrafted cachets. As a result, the cover collector has seen a huge influx of would-be artists come into the cachet-making field. This influx has caused the production of a great deal of hand-painted/colored cachets that can be very expensive. It is not uncommon to see a cachet for a recently issued stamp to be priced at $50 to $70 per item. A great deal of time and effort goes into this type of cachet. Consequently, the cachet maker has to command the ultrahigh fees for his/her work. Although the number of handcrafted cachets of a given cachet maker may be only a few dozen at the most, the appreciation rate has been unremarkable because of the large number of artists doing this type of work. If you are interested in starting a collection of handcrafted FDCs, I suggest that you establish accounts with cachet makers who are well established in their field and entered it sometime before the modern influx of neophytes. Two cachet makers that I would recommend are HAM Cachets, produced by Lois Hamilton, and Collins Cachets, produced by Fred Collins. Collins began his cachet-making career in 1978, and Hamilton began in 1974 using the signature of "L.H." Their productions usually carry a price tag of $20 to $30 per item, with many of their covers appreciating to $100+. For a more precise profile of what's available in handcrafted cachets, I suggest that you consult with a dealer who specializes in FDCs. I have found Lee James of Lee's F.D.C. 's, located in Combined Locks, WI, to be very helpful in this area, as well as in many other aspects of FDC collecting. He is a good teacher and an honest and ethical dealer. There, you have my comment. Now, what is your comment? As readers of Across the Fence Post, you may have noticed an article in this series that appeared in the May-June 1995 issue where I explored the methods/topics related to first-day cover collecting. I stated that the methods of FDC collecting parallel general philately rather closely, but with some exceptions. Keeping this in mind, you may have considered that the entire methodology of FDC collecting had been explored in sufficient detail. There is, however, one method that is exclusive to FDC collecting, and this is the collecting of first cachets - the first attempt at cachet making. Generally speaking, cachet makers' first efforts are often a long way from their best work because the field is new and knowledge is often limited. After that first cachet has entered the market (usually the resale market), cachet-makers begin to hear critiques from other cachet makers and/or collectors (mostly collectors). This experience plus self-criticism prompt improvement. Thus, cachet makers often do not reach their zenith until after a few to a great many cachets have been marketed. Then again, there are some first cachets that display rather sophisticated artwork. 'The new cachet maker who has mastered his skills usually maintains this high level of cachet art, or looses motivation and then, sadly enough, quality begins to deteriorate. There is some debate as to what constitutes a "first cachet." Many cachet makers have published under two or more signatures. Some collectors, therefore, feel that the very first cachet produced, regardless of the signature used (or not used), and is the only legitimate first cachet. Others state that the first cachet published under a specific signature, regardless of the artist, is a legitimate first cachet. In the latter case, it is quite possible for a cachet maker to have multiple first cachets, limited only by the number of signatures used. The cachet illustrated below is one of two so-called first cachets produced by Charles J. Peirce, proprietor of the New Deal Cover Service, that later was known as the Oshkosh Cover Service. This is the first cachet for the New Deal Cover Service, which operated during the 1930s. Most experts agree that this is Peirce's actual first cachet. 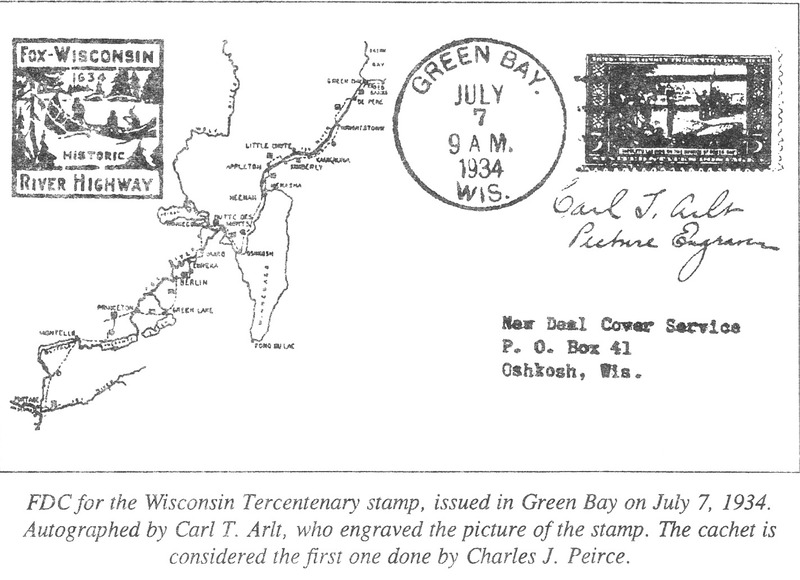 I would like to add that the late Charles Peirce was a longtime member of the Oshkosh Philatelic Society and the president of the WFSC for the 1947-48 term. The introduction of a new line of cachets can be considered an historical event. Thus, there is an opportunity to possess and preserve an item of historical significance with the additional potential of vigorous value appreciation. Charles Peirce's first cachet sold for 11c when it made its debut in 1934. The current market value is in the neighborhood of $30. Taking into consideration a correction for inflation, this is an appreciation of about 2500 percent over a period of 61 years. With the scarcity of first cachets published in the 1930s, which are still being traded, some first-cachet collectors have been known to bid up the price of such an item at auction to $50 or more. For the philatelist who is considering putting together a collection of first cachets, I would highly recommend the acquisition of a publication titled Mellone's First Cachets. This is a catalog of all known cachet makers. By Scott number, it lists the stamp issue honored on their first cachets, the cachet signature used, as well as the cachet maker’s legal name and the stamp/item featured on their last cachets. If a cachet maker continues to publish, this information is also re-corded in this volume. 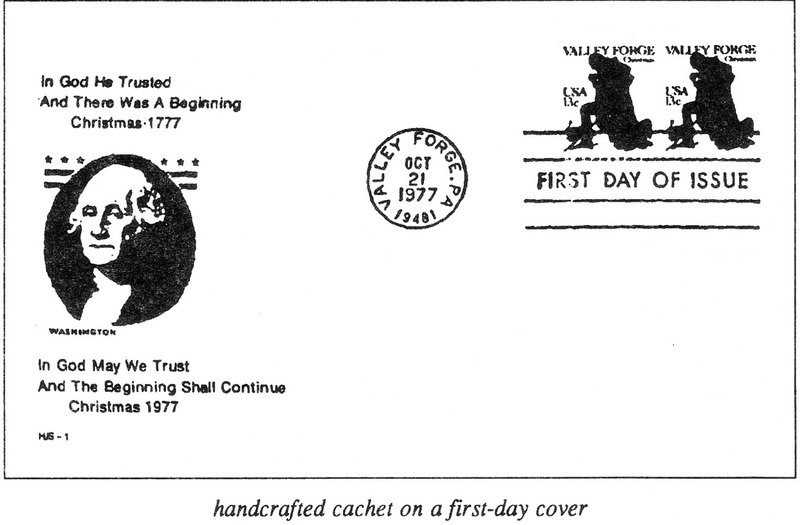 Mellone's First Cachets was updated in 1989 for the second time since its first appearance in 1980, with continued updates appearing in First Days, the highly prized journal of the American First Day Cover Society. In addition, the AFDCS annually publishes a Current Cachet maker’s Directory, listing active cachet makers. Let me know if you're interested in any of these publications.